We provide a comprehensive study of theatre giving students a solid foundation for the discipline so they can become knowledgeable theatre professionals. We believe it is important to understand all elements of theatre in order to appreciate their intersections and the collaborative nature of the creative process. 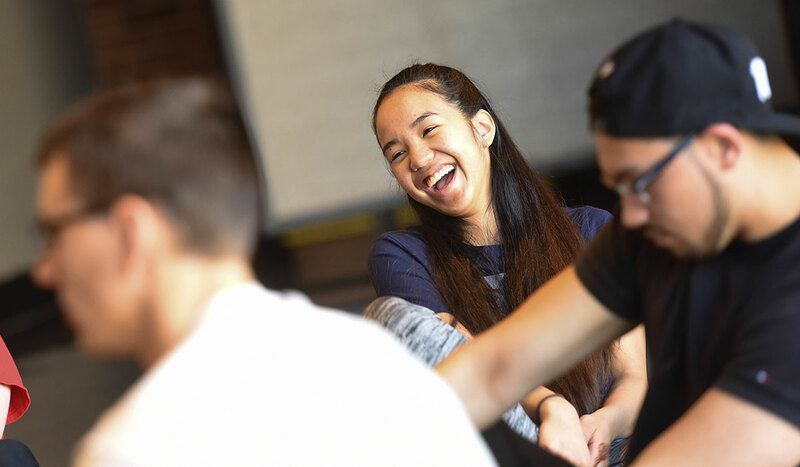 Exposure to the various aspects of theatre gives students an opportunity to find what sparks their passion and an opportunity to focus on their interests. Explore ALL areas of theatre and become a fully informed professional: Acting, Design, Production, Directing, Playwriting, and Literary Analysis. Engage directly with working professional theatre artists who are experts in their field. Start building your professional network from day one. Gain marketable skills and practical experience applicable to theatre or beyond. Join a tight-knit family and connect with a worldwide network of alumni. Access to over 90 professional theatre companies in the DC-MD-VA area. MFA Directing Projects: collaborate with graduate student directors, actors, and playwrights on projects that explore both classical texts and new works. The drama department provides many opportunities for students to apply classroom learning to real world situations. Through our program gain experience and marketable skills for the world of theatre and beyond. We provide connections to more than 80 professional theatre companies in the metro D.C. area. Through our faculty's expansive network our students receive opportunities with prestigious institutions such as Arena Stage, The Kennedy Center, Signature Theatre, and Woolly Mammoth Theatre Company among others. Gain access to internships and readings, as well as free or discounted theatre tickets through our program. Participate in D.C.'s annual Fringe Festival or Source Festival, which have opportunities for emerging artists. Build your network with professionals before you graduate. The Department of Drama has a worldwide network of alumni who are involved in all aspects of theatre. Our alumni have become notable artists in American theatre, film, television production, and corporate entertainment. Among them are Oscar and Tony award-winning actors and directors, Pulitzer Prize winning Playwrights, Broadway designers, and theatre critics for the New York Times, The Washington Post, and respected journals. Many alumni are currently in leadership positions in major theatrical venues, including Arena Stage, the Yale School of Drama, and the Brooklyn Academy of Music, as well as in professional and academic organizations. Our graduates have been affiliated with a variety of professional theatres throughout the country, from the Shakespeare Theatre in Washington, D.C. to the Wooster Group, an internationally known off-Broadway experimental theatre company, and from the Guthrie Theatre in Minneapolis to the New York Shakespeare Festival. Our graduates work for Disney, with Dreamworks, in network television news and popular sitcoms, Catholic television production, the Public Broadcasting System, and with Voice of America. Alumni also serve on college and university faculties, in private acting studios, and Catholic and public high schools. There are very active communities in New York, Los Angeles, Chicago, Boston, and the Baltimore-Washington area.